Before 25 January 2011, I had never been to a protest. In fact, I had never really experienced any kind of on-ground political act. So, in all honesty, it was mainly curiosity that led me to Tahrir Square. I was with a friend buying some clothes near the square when we heard that more than one thousand people were gathering there. We both felt compelled to go and see what was happening. It seemed foolish not to go. Little did we know, this would later turn to a number of visits to the square during two or three years in which we joined protests, fainted from excessive amounts of tear gas, faced rubber bullets, metal pullets and live ammunition. Everything in Egypt changed forever on January 28th. On this day, the clarion call for protests echoed across the country. It was a message that reached the Facebook accounts of thousands of Egyptians, particularly the youth. It was a message that gave us hope. Hope that the protests would grow larger and more effective. That it could actually amount to something. We had a plan to start marching on Friday with the objective of demanding reform. It was decided that after Friday prayers would ensure the highest impact as it is are a ritual that almost all Egyptians take part in. This same plan was being implemented in different cities in Egypt with protesters aiming to march towards main squares in their cities. The government provoked protesters when they decided to cut off all telecommunications and internet connections all over the country. 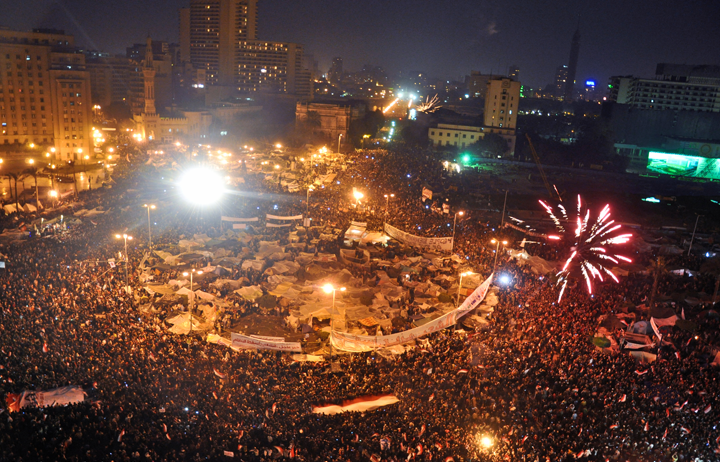 At first, the occupation of Tahrir square was not intentional. It was the police brutality during the 28th of January, the way they prevented anyone from reaching the square, that had the opposite effect of prompting those in the streets to aim for the square. When all the blockades made by the police were surpassed and after fierce hours battling the government, in which hundreds died, the revolutionaries were able to stand their ground. It was through these battles that Tahrir came to symbolise the struggle and ultimate triumph over a regime that lost its legacy. Once Tahrir square was captured, it transformed into a foreign land, an ephemeral utopia where all those who were against the status quo could gather, all those who were never able to represent themselves or express their views since they were born were finally able to do so. This attracted different types of societies and for the first time, all these different groups were able to coexist peacefully. Suddenly, there was this place where sexual harassment did not exist, Christians protected Muslims during their prayers, volunteers collected trash, food and medicine supplies that were coming in every day from all over the country. A makeshift hospital was created and underground musical bands entertained those who are visiting. For once, we felt that we belonged to this country and that we could put our differences aside uniting under one goal. Unfortunately, and even though we achieved our primary goal after 18 days of protesting ousting a dictator that ruled the country with an iron fist for 28 years, the unity did not last. Once Mubarak was removed, everyone had the same exact thought ‘Now what?’; who should rule the country and in what way? During the widespread confusion, one particular group was working perfectly. It knew where they wanted to be, a group that has been working in politics for decades waiting for such a chance; the Muslim Brotherhood. The activists and protesters did not realise that Tahrir square was no longer as important as it was and that we were about to face a fresh and more enduring challenge. A deep political problem with no easy answer. Those who supported you before were not going to keep providing support unless you could present concrete solutions to a country that does not have a President or a parliament and was starting to suffer from an economic collapse after months of national strikes and turmoil. The following weeks after the Tahrir occupation witnessed significant disagreements between all sides who took part in the uprising. Everyone wanted to grab a piece of the cake, including revolutionaries themselves who were more than divided and a Supreme Council of Armed Forces ruling the country with no apparent idea how to do so. During this period of chaos, the Brotherhood were hustling and working hard on their political agenda and to be the political party that later managed to attract most of the votes. Months later, we found this party along with a Salafist party that represented radical Islamists, who were all once our protests companions, acquiring seventy percent of seats in the Parliament, an Islamist President from the Brotherhood and a new constitution being written by the same majority. This happened while those who risked their lives and future for the revolution were marginalised. Their once jubilant voices that echoed powerfully across the country, radiating out from Tahrir square, now faded into meek silence. It is my opinion that the revolution was hijacked away from those who started it because those people were too naïve and inexperienced when it came to political work. We innocently thought that since we managed to remove a dictator with protesting, we could build a country using the same method, something that was proven wrong in the months afterward. I believe a powerful reason behind this naivety was that very few of the participants were ever active in the political sphere, predominantly because being politically active before the revolution meant endangering your life, career and family. After enduring months of a country on the verge of collapse, ordinary citizens wanted stability after anything so when they went to vote, they voted for those who had experience, those who could convince them that they have solutions, and in most cases, those who had the money to support them during elections. Those who knew how to deceive a population, where almost half were illiterate. In addition to this, they voted for those who said that they were close to God and will implement ‘God’s views’. In retrospect, if we were back to 2011 or even 2010 before everything started, I think we should have backed our protests and resistance with a political agenda under one coalition. A coalition that could communicate our views for the country to the average citizen who is mainly concerned about their family and income. At some points the revolutionaries were more involved in political work on the Internet, where it all started, a place that only included 25 million Egyptians in 2013. If I could go back in time I would have aimed to increase on-ground initiatives outside the Internet and outside of Tahrir square. Initiatives that could help normal citizens understand the country’s situation and explain what the revolution was all about. By educating the population, we could have gained more public support that could have been reflected in elections, giving more chances to those who took part in changing Egypt and managed to do so in decent and peaceful ways. In the months and years after the 2011 protests in Tahrir Square, our side should have been more understanding towards the fears and concerns that most Egyptians had during these days and addressed them in each and every square and not just through Tahrir. We have learnt so much since Tahrir Square, and it may seem obvious with hindsight, but removing an autocratic leader is the first step, not the last step for a new political order. Abdelrahman is a communications enthusiast living in Cairo, passionate about everything revolving around startups, entrepreneurship and technology, in addition to civil rights in the Middle East. He is also a 2017 Gabr Foundation Fellow. During the revolution he was interviewed by the BBC, which you can read here.